Experience the best of Philadelphia’s murals in a unique and exciting way. 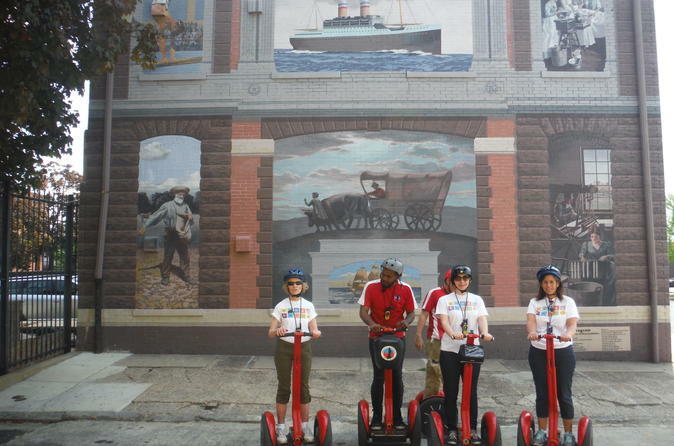 Enjoy the ride on a Segway as your expert local guide takes you along the backstreets of some of Philly’s most artistic neighborhoods. Learn about the history and legacy of the Mural Arts Program, and view over 20 murals throughout your one-of-a-kind Segway tour. You'll be trained in the art of Segway riding before your tour and your guide will take pictures for you and send them to you free of charge at the end. Before you begin your 2-hour tour of Philadelphia you will get a full training course so you can feel confident and safe as you venture onto Philly's streets. Start your journey in Old City and then head north into some of the most eclectic and exciting neighborhoods in Philadelphia, known best by locals. Throughout the tour you’ll learn about the history of the Mural Arts organization, and about how these murals were produced. Some of these murals are tucked away along side streets, and designed by skilled artists with help from local communities. Your guide will point out some fantastic hidden gems, along with more than 20 diverse and dynamic murals. As you work your way from Old City to Northern Liberties, you’ll discover your first mural of the tour in a place you’d least expect. View murals featuring an amazing variety of colors, styles and themes. You’ll have a chance to step off your Segway for a closer look. Break at a local coffee shop, café or sandwich shop for a quick stretch of the legs. As you continue your trek through Northern Liberties, and then into the Spring Garden ('Loft District') area, you’ll pass by some of the best pubs, restaurants and music venues in Philly. Your guide will be happy to give you recommendations of his/her favorites. Murals will appear in the most unexpected places, and you’ll learn why each is special to the city. After an exciting ride through Chinatown, make your way back to Old City. At the end of the tour, your guide will send you pictures of your Segway mural experience to share with friends and family.